(Nanowerk News) Graphene on silicon carbide could be an interesting candidate for future spintronics components. Squeezing gold atoms between the semiconducting substrate and graphene does enhance spin-orbit interaction at hot spots and shows ways to controll the spins. First results at BESSY II are now published in Applied Physics Letters ("Rashba splitting of 100 meV in Au-intercalated graphene on SiC"). In electronic circuits, the charge of the electron is decisive. In a future spintronics, however, the essential role will be taken over by the spin of the electron because it enables a potentially lossless transport of information. 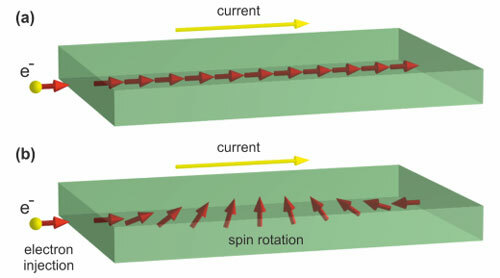 This requires the development of materials that can conserve the spin information over long distances but also manipulate it. In this context, graphene has been discussed because of the long distances the electron spin can travel without losing its orientation. A couple of years ago HZB researchers Dr. Andrej Varykhalov and Dr. Dmitry Marchenko demonstrated that also the completely opposite is possible with graphene. Graphene rotates the spin of the electrons when brought in close contact with gold atoms. This finding has led to a number of breakthroughs in the meantime. They had, however, a common disadvantage. In order to get the gold atoms really close to the graphene, graphene was deposited on a metal substrate such as nickel, and the gold could afterwards easily be squeezed between the graphene and the metal. This enhanced the so called spin-orbit interaction in the material by a factor of 10 000. Calculations show that an effect of this order of magnitude is linked to a half rotation (180°) of spins after traveling about 40 nanometres. This is the length scale where miniaturization of conventional electronic devices has arrived nowadays. Because the substrate is a bulk metal and conducting there are many more electrons flowing with completely random spin orientation which causes something like a short circuit to the spin information. 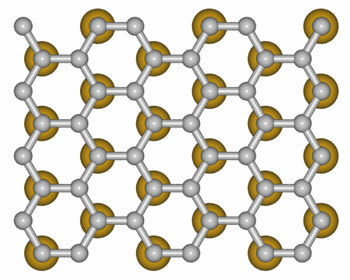 This means that the graphene has to be grown on an insulating substrate. The semiconductor silicon carbide is a famous substrate for graphene. The difficult task was to control the charge doping of the sample. Interestingly for small amounts of gold, the graphene charges negatively and for larger amounts it reverses and charges positively. Marchenko, who had employed the trick with the gold on the nickel in his Ph. D. thesis recalls that it was very difficult to produce the pure positively charged phase. After many trials he succeeded and could study it with the method of spin-resolved photoelectron spectroscopy. What Marchenko found was a very different behavior as compared to graphene on previous, bulk metallic, substrates. From previous experience, he searched for large spin-orbit effects near hybridization points, so-called hot spots in the band dispersion. He found there a very large splitting of 100 meV, in the same enhancement by 10,000 over pure graphene. However, the effect is only limited to the vicinity of the hot spot - and this is very different from the cases with the metal substrate. For the researchers this means that to make use of high spin-orbit effects of graphene on semiconductors they need to dope the system by a second element or use a gate voltage to move the hot spot to the Fermi energy where it can contribute to the transport. "In this case, a rather small gate voltage change should modify the splitting from 0 to 100 meV, working as an on/off switch for spin effects in a graphene based device", Marchenko says.